Ottawa’s First Underground Chef’s Market a Success! Sold out and bursting at the seams with delicious creations, Ottawa’s First Underground Chef’s Market was a definite success! 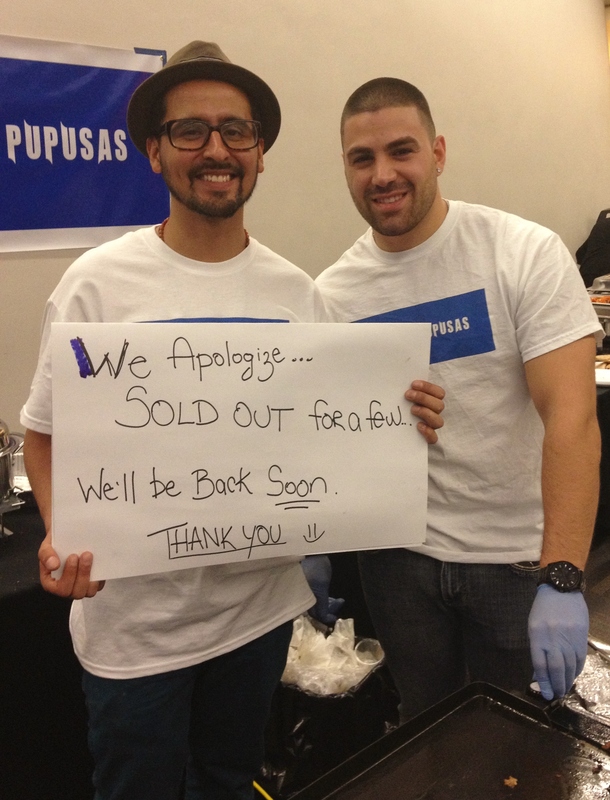 Sold out — their pupusas were popular! There was a long wait at the bar, and some confusion when lines at different vendors criss-crossed, but overall there was an excited buzz in the Ottawa Convention Centre as market-goers tasted what local chefs had to dish out. With everything from duck confit sliders to chocolate sushi on offer I didn’t get a chance to taste everything, but I put in a good effort, and what I did taste was delicious (somewhat surprisingly, my favourite discovery of the night might have been these raw organic truffles…). The vendors I spoke to were all very enthusiastic; for many of them it was their first time selling their dishes at a public event, but there were also chefs from established restaurants as well as one of my favourite street vendors on hand. 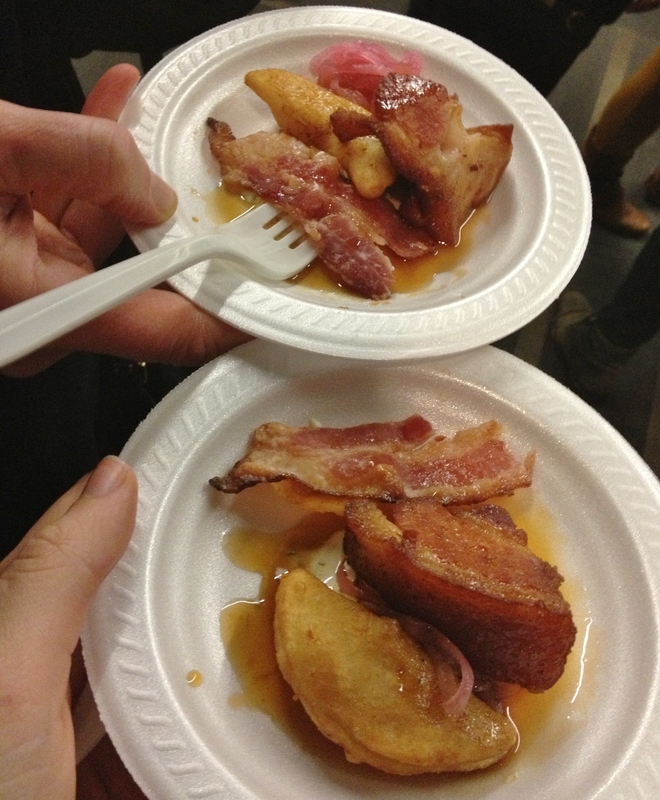 Confit pork belly, smoked bacon & a pierogi from Mitch’s Pork Station — a delicious trio. 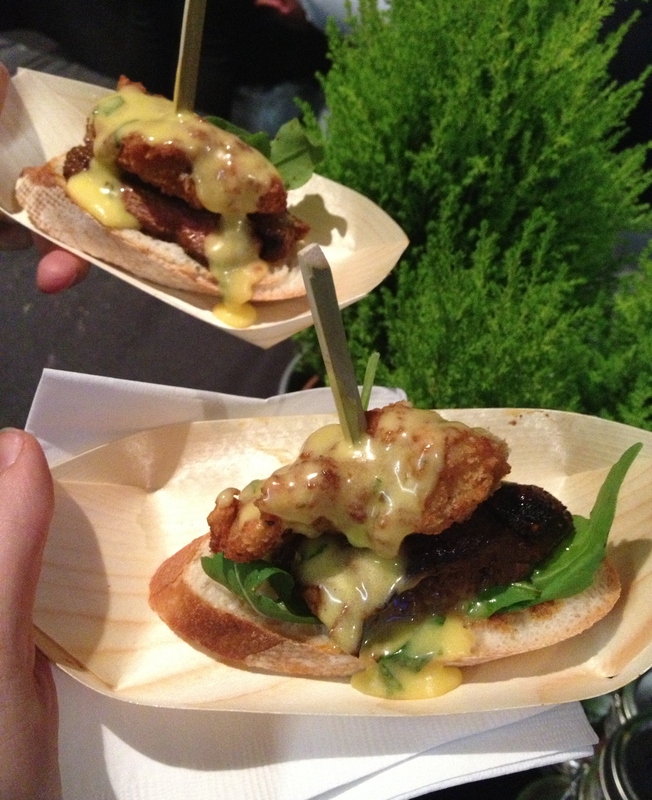 YumTown City’s “Carpet Steak” sandwich with a deep fried oyster on top…so good. The event organizers, Privé Food Thought, are already busy planning their next event: a Noodlefest on February 22nd. Check out their website and Facebook page if you want to keep up with what’s happening in the new year. If you’re interested in becoming a vendor, you can get more information and register here. This entry was posted in Food, Glorious Food!, Local Loving, Travel and tagged local, ottawa, Ottawa events, Privé Food Thought, Underground Chef's Market by kshap. Bookmark the permalink.